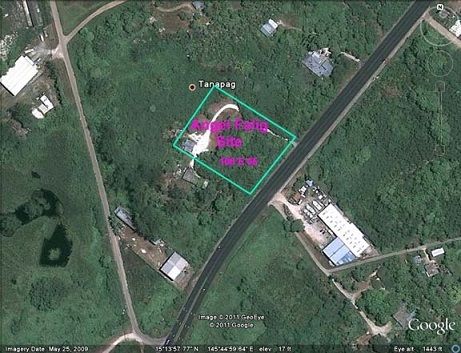 The Angel Falig Property is part of the Tanapag Fuel Farm (TFF) site which is listed in the Formerly Used Defense Site (FUDS) inventory for the CNMI. The Falig property is a 1.48 acre which makes up 96-acre of the TFF site in Tanapag Village. It contained as many as 42 above-ground fuel storage tanks ranging in capacity between 1,000 and 10,000 barrels (WCP, 2004). The Falig Property is situated between 2 land parcels where Tank #13 and Tank #14 were situated. The Tanapag Fuel Farm (TFF) was built and used by the U.S. Military and was part of its military retention area after World War II. Immediately after the U.S. Military operation on Saipan, the Mariana Islands were controlled by the U.S. Trust Territory Government of the Pacific Islands under the U.S. Navy prior to the establishment of the CNMI government in 1976. After the CNMI government was established, the lands of the Mariana Islands were involuntarily acquired by the local government. The fuel tanks were never maintained since when the US military left the island and deteriorated over time. As the tanks deteriorated, petroleum products have been released into the environment. There was contamination at these tank sites which include the Tank #13 and Tank #14 area. These fuel tanks were located within residential and commercial areas, although there are some that still remain until today. Between 1998 and 2004, a remedial investigations report determined the presence of total petroleum hydrocarbons in the soils and groundwater at 13 of the tank locations (WCP, 2004). In 2006, the U.S. Environmental Protection Agency (EPA) and the CNMI Division of Environmental Quality conducted the Tanapag Tank Removal Project, which was led and funded by EPA. Six fuel tanks were dismantled and removed; the residual petroleum product left in the tanks was properly disposed Contaminated soils saturated with petroleum were also excavated and disposed of properly. The project included the removal of Tank #13 and #14 sitting on properties adjoining the Falig Property. investigation is warranted to address the RECs for the subject site to address existing environmental concerns regarding the former tank farm. Response Status: Phase I ESA completed in October 6, 2011.